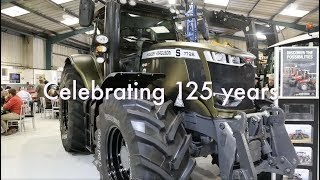 Since starting trading in 2015, Suffolk Farm Machinery Ltd has built a successful business importing and distributing a selection of leading and innovative brands. David Williams attended its first open day. Armatrac tractors and Bobcat excavators and loaders featured at Suffolk Farm Machinery Ltd’s January open day. (l-r) Bobcat London representative Phil Stoneham; Suffolk Farm Machinery’s Jason Garrard and Richard Carr; Clover Farm Services Dwayn Clover, and from Suffolk Farm Machinery – Suzie Carr and Graham Catling. The late January open days provided an opportunity for new and existing customers to find out about the wide range of products offered, many of which were available to test drive. Among the established brands were Hawe Wester field transfer trailers for which Suffolk Farm Machinery is the sole UK importer and Laumetris high capacity bulk produce and flat trailers, also solely represented in the UK by the company. Other brands include Reiter grass and forage pick-ups; Saphir loader attachments, silage clamp rollers and grabs, and Fransgard mowers, rakes and tedders. New to the dealer is the Armatrac tractor franchise for Suffolk, Essex, Herts, Cambs and south Norfolk and the Bobcat loader and handler franchise for Suffolk and Norfolk. Completely new products to the UK include JMac wheeled loader back-hoes, available with conventional or equal-sized front and rear wheels, which were demonstrated at the event. There was ample opportunity to try out Bobcat excavators and a JMac back-hoe loader. Sales and range growth has required investment in additional team members and a new sales and operations manager, Jason Garrard has joined from a background operating plant for a drainage and groundwork contractor. He will also help establish the Armatrac brand in the region. An additional service engineer will start with the company in early March, having previously been employed by a local main dealer. The new appointment will also include responsibility as a product specialist and demonstrator. For many open day visitors it was the first opportunity to find out about Armatrac tractors having seen the range only at national shows in the past. “It offers a good, sensible package and when potential users start looking closely at the specification including Perkins engines, ZF transmission and Bosch electronics along with a two-year standard warranty which is extendable, they quickly recognise that these tractors will perform well, prove reliable and provide a cost-effective solution for smaller arable, livestock and mixed farms. Laumetris trailers have proved a success for the dealer and Richard commented that he has sold 15 of the high specification products so far in the UK. “We have a silage contractor running 3; having bought one to try and then adding another 2 as the first so impressed him. Saphir attachments are another quality German brand explained Richard, adding that the tractor-mounted silage clamp rollers have proved particularly popular. RG Amies operated a large fleet of hire machines across East Anglia and Richard intends to continue this popular service, and add JMac machines too, providing a greater range of handling solutions for customers. “We had a very successful first open day and received enquiries and orders for products across the range, and requests for demonstrations including grassland machinery as soon as the weather allows. Michelin displayed a selection of tyres, including its new X Tweel SSL (Skid Steer Loader), air-less radial tyre. High strength, poly resin spokes carry the load and absorb impacts, providing support, cushioning and advantages over a solid alternative. It includes reduced weight on the skid steer’s drivetrain, provides the comfort of a radial pneumatic tyre and the ability to travel up to 16kph carrying 2t per unit. The cost of a 12×16.5 X Tweel SSL in the All Terrain (AT) pattern is approximately £990/corner. The X Tweel SSL can be re-treaded when the original tread is worn, extending the working life and reducing costs. Tom is pictured (right) with the X Tweel SSL, and with local tyre supplier K&M Tyres director, Mark Bond. 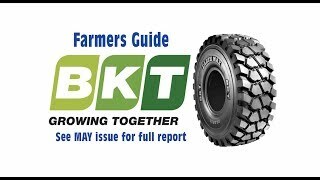 “We have been trading for approximately 15 years and our company is the Michelin Exelagri distributor for Suffolk and south Norfolk, with full access to Michelin, Kleber and Taurus tyre ranges,” explained Mark. “We have demand for all three brands and tend to supply Michelin to those needing premium performance, Kleber is our mid-range tyre and Taurus provides a cost-effective solution for less demanding applications but with the full back-up of Michelin.